Constant stirring helps vegetables cook evenly. Sautéed vegetables develop a tender, crisp texture and a bright color that makes them as beautiful as they are tasty. High heat combined with a small amount of olive oil cooks the vegetables quickly so you can't step away from the stove during the process. Vegetables also cook at different rates. Cutting them into small pieces and adding them in stages helps ensure that all the mixed vegetables are done at the same time and nothing burns. Slice the vegetables into small pieces. Cut firm, slower-cooking vegetables such as carrots or potatoes into 1/4 inch strips or cubes so they cook more quickly. Cut quick-cooking vegetables such as peppers or onions into strips up to 1/2 inch wide. Tear leafy greens such as spinach into bite-sized pieces. Heat the pan over medium-high heat until the it is hot. Add just enough olive oil to coat the bottom of the pan. 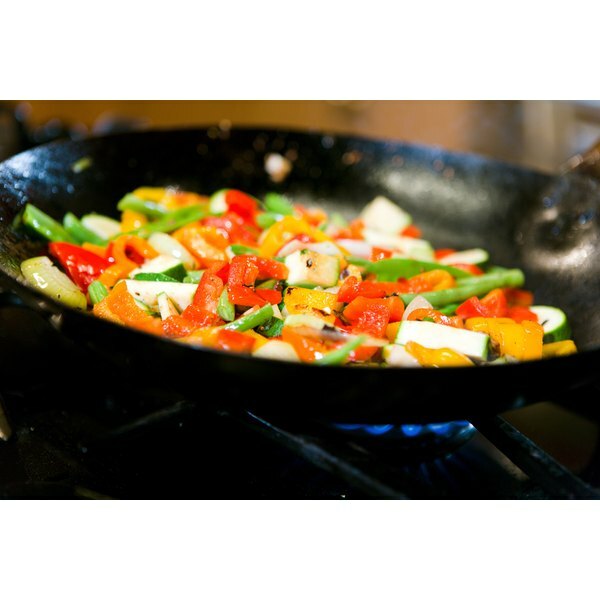 Add the firm vegetables to the pan in a single layer, leaving space between the vegetable pieces. Stir the vegetables or shake the pan every 20 to 30 seconds so all sides cook evenly. Place the quicker-cooking vegetables in the pan when the firm vegetables become tender, which usually takes about five minutes. Keep the vegetables in a single layer and continue to stir or shake every 20 to 30 seconds. Cook for two to three minutes more, or until the vegetables are tender. Sprinkle leaf vegetables into the pan once the other vegetables are crisp-tender and their color brightens and becomes glossy. Stir the leaf vegetables once or twice until they just begin to wilt, then remove the pan from the heat. Serve sautéed vegetables immediately. Season sautéed vegetables during cooking or immediately after. A little bit of salt combined with a pinch or two of your favorite herbs, such as thyme or rosemary, complements the flavor of the vegetables without overpowering them.